Whenever Rich Guy is in town, it is a real treat. Yes, he does willingly eat with me at almost anywhere - that is a benefit for sure. However, the real treat is that he hits his bro up for Canuck tix. You see, Richer Guy owns a suite at Rogers Arena and he has tickets to give away to clients. Well, I'm not exactly a client; but that is where Rich Guy comes into the picture... So he was able to secure tickets to the Columbus game. We met up at Richer Guy's place and he gave us a lift in his Benz to his personal parking spot at Rogers Arena. Interestingly, the gate attendant asked where his Ferrari was at... They know what car he drives?? ? Boy, he is definitely Richer Guy! Now as for the game, it was as boring as watching molasses strain through a sieve. If it weren't for the shootout win, we would've fallen asleep. Hey, I shouldn't complain. Game tickets, parking spot underground and driven to and from in a Benz. Hey... we should've asked him to take the Cayenne instead! So after the game, there was only one thing left to do. Eat! 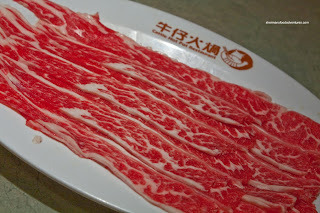 Since we were getting close to Richmond, we decided to head for late-night AYCE at Cattle Hot Pot. For $17.95, it looked like a decent value. However, much like any other hot pot joint, the soup base nor the special sauces are included. Personally, I find this misleading. Nothing against Cattle Hot Pot per se since every place does the same; but if you're going to charge for broth other than boiling plain water, then just add it into the price. It is just a pet peeve of mine. So we ended up with half Satay and half Ching Bo Leun (it's a herbal soup). We ordered as many items as 2 people could eat, especially late night! We started with the Fatty Beef which was well-marbled, fresh-looking and extremely tender when cooked. 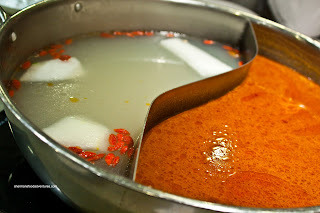 For me, it always tastes better when boiled in the satay side of the soup. 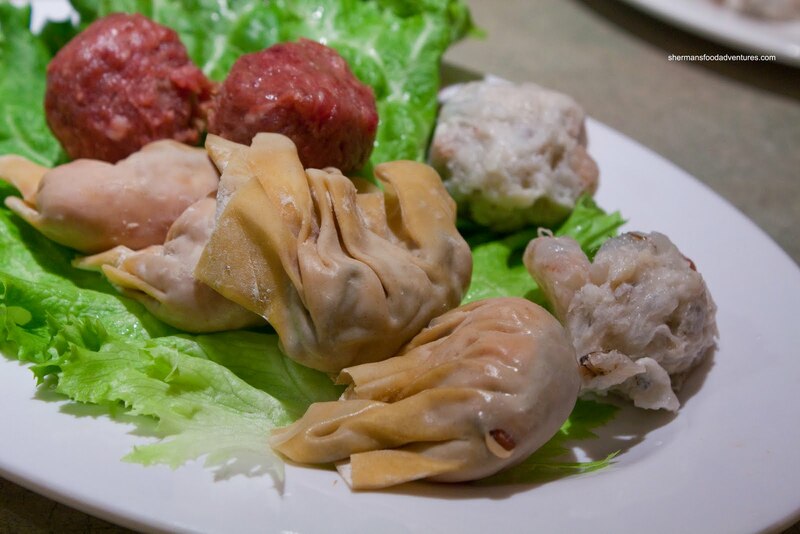 As with most hot pot places these days, the meatballs are freshly made, not frozen. The Beef Meatballs were indeed a nice colour and had the perfect texture. When cooked, they had an excellent bounce texture when bitten into. As for the fresh Shrimp Meatballs, these were my favourite. A mix of shrimp puree and whole cold-water shrimp, it was like eating a shrimp wonton without the wrapper. Very tasty too, nice and sweet. We also got some Sui Gow which are quite similar to wontons except for being bigger and with the addition of wood ear mushrooms. These were good since the base of the filling was the excellent shrimp puree/shrimp mix. As with any hot pot, seafood is a must, so we got some Basa, Oysters and Shrimp. Other than the large oysters, the other items were previously frozen. 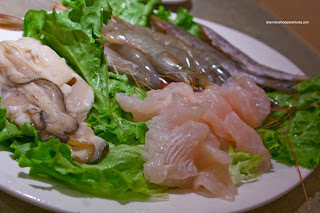 This is not a negative though because there is no live basa here and it is not spot prawn season (let alone they would actually serve that in an AYCE). So what it was, it worked and that's that. A relatively popular item these days is the Pork Cheek. Well, actually anything cheek is trendy, whether it be a halibut cheek or lamb cheeks. Why is it popular? Well, the cheek has a unique texture that is not readily found anywhere else. When cooked briefly, it is slightly chewy with a rebound-type texture. By no means is it tough, it just has some bite. Now if you braise it, suddenly, the texture becomes a bit gelatinous. 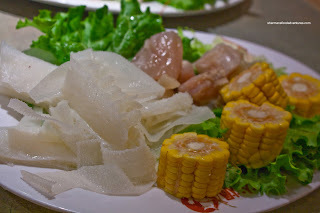 Of course, at hot pot, we would've just boiled it quickly and it would have the aforementioned qualities. Next, we got a plate of mushrooms consisting of Enoki and Shiitake. Well, what can I say, they were good mushrooms and when cooked, they were good as well. 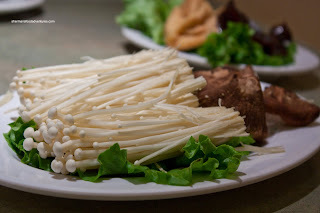 Just don't over boil the enoki, it's gross that way. 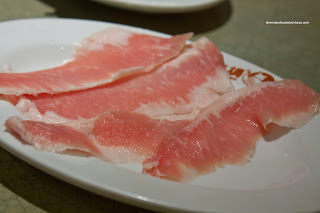 For me personally, I need to have some offal at hot pot. The more the better actually. However, not everyone shares my love for "the best parts of an animal". Rich Guy falls into that category. So I only got a conservative amount including Bible Tripe and Beef Tendon. The tripe boiled up to be easy to chew while the tendon was precooked enough so that it was soft to eat once boiled. I liked that the tripe did not have any gamy flavour which indicates it was properly washed beforehand. Oh, the corn on the same plate was really good. Not sure where they got fresh corn from; but it was sweet while each kernel was not not tough. We actually got a few more items such as tofu, watercress and bean curd skin; but they are hardly picture worthy. You just have to trust me when I say they were good as well. Again, hot pot is not a difficult thing to do. What you need is a good flavourful broth, fresh ingredients and decent service. We got all 3 this time around. So that would mean we would do a repeat visit. It's been a while since I've went to Cattle Hot Pot due to a bad experience with their oysters. I tend to go to So Hot So Pot these days, which is not as crowded. Maybe it's me...but seems fairly ironic or sadomasochist to name the restaurant after the animal you're going to consume ie Chubby Lamb, Fatty Cow, etc. 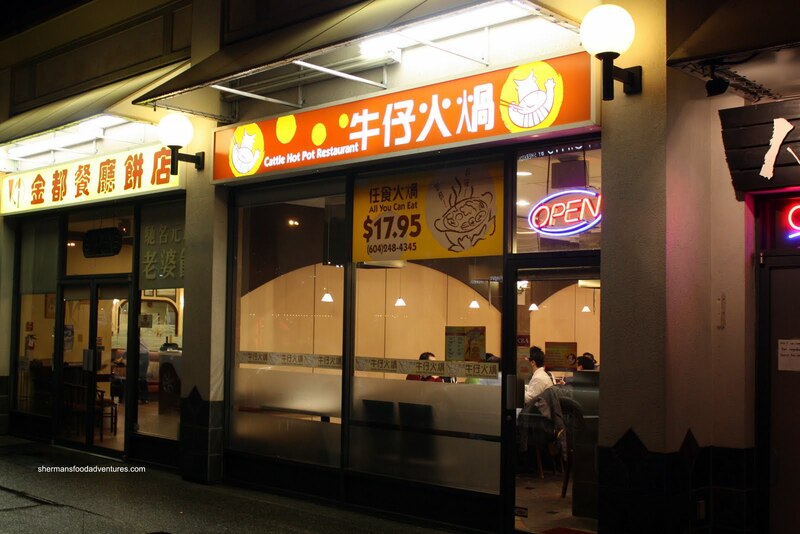 @Janice, yes, I am planning on visiting So Hot So Pot very soon! Well before it gets warm outside. @Teresa Haha, you are right. I often think of that.